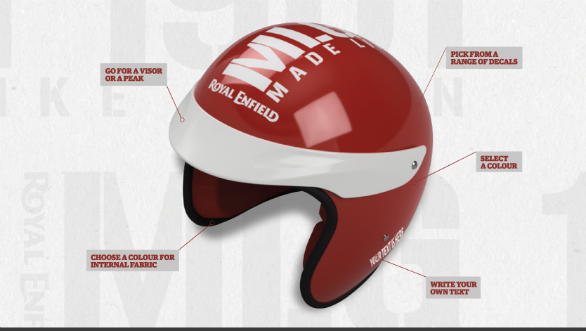 Royal Enfield has introduced a line of customisable helmets to its range of apparel and riding gear. A 'Make Your Own' section has been set up on the apparel website for this purpose. Only available on helmets now, this facility will be extended to a range of gear. There are over 500 combinations that the buyer can chose while configuring their helmet. For now only an open-face helmet is available but everything else like decals, shell base colour, finish, visor, peak, peak color and the inside lining can be chosen. Personalized text can also be added up to 14 characters. The helmet is priced at Rs 3,200. Online payment and delivery options are also available. The Royal Enfield apparel store stocks gloves, boots, bags, jackets, T-shirts, motorcycle covers, multifunctional headgear and a host of other products.